NEW YORK, New York — Friday, the last day of our Yaya sister adventure, how I hated to see it end! Pam caught a very early train back to D.C., and Heather and Marion left for the airport shortly thereafter, leaving just Jeanne and me to enjoy one last day in the city. 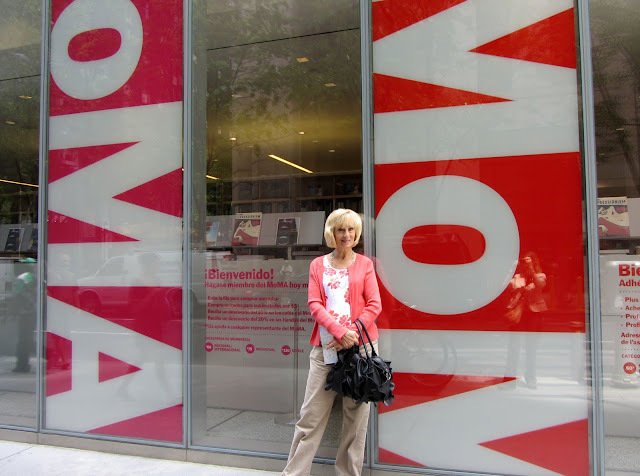 After a brief walk in Central Park, we headed for the Museum of Modern Art (MoMA), which promised Jeanne the opportunity to meet one of her favorite paintings face to canvas. MoMA always delivers an interesting experience with the diversity of art in their collection. Works by Rodin, Picasso, Monet, Cezanne, and other well-known artists are there as well as more avant-garde items like Lawrence Weiner's A Wall Pitted by a Single Air Rifle Shot, which is... well, a large white wall pitted by a single air rifle shot. Seeing this definitely generated one of those forehead-slapping, why-didn't-I-think-of-this moments. Who knew someone would buy such a thing as a piece of art? 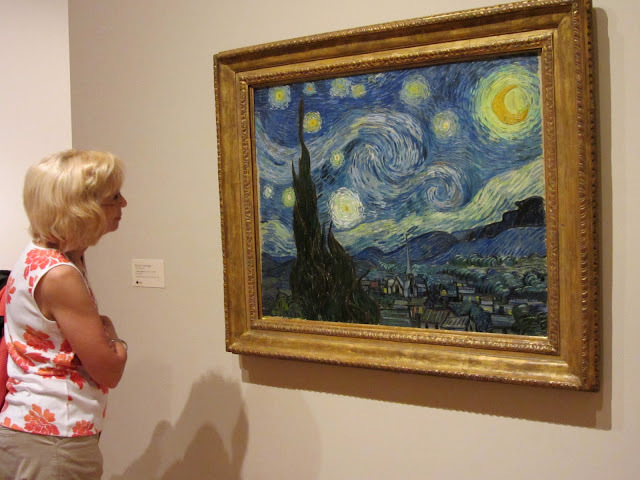 Of course, the main reason for our visit was the most famous painting of Vincent Van Gogh, The Starry Night, which has been in the MoMA permanent collection since 1941. Painted in 1889, the painting represents Van Gogh's night view from his room in a Saint-Remy sanitarium, though he is said to have painted it from memory during the day. We were fortunate to be viewing the painting when a guide came through with a tour group. We listened as she talked about this famous work, finding both enlightenment and dubious speculation in her comments. If you'd like to get an up-close and personal look at this beautiful art work, check out the extremely high resolution image of it from Google's Art Project site. No visit to MoMA is complete without a peek at the incredibly clever items for sale in their gift shop. In addition to the expected poster reproductions of works in the collection, the shop searches out ingeniously designed products that are both useful and whimsical. Prices are quite reasonable and the inventory includes something for everyone from infants to adults. 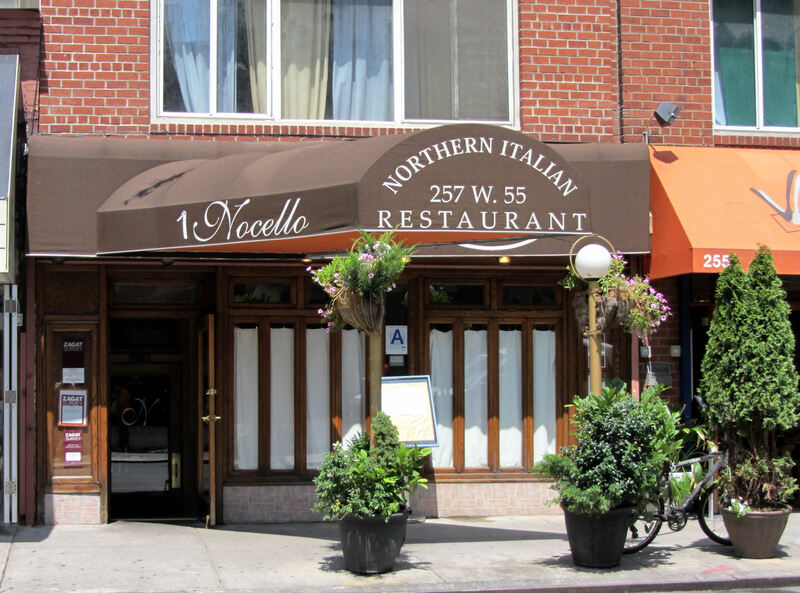 After getting our fill of modern art, we found a fabulous lunch just off 8th Avenue at Nocello, a neighborhood Italian restaurant. It turned out to be the perfect laid-back place for lunch. Prices were reasonable, service was attentive, and the food was delicious. One last trip to Times Square was in order to find a souvenir for Jeanne's husband, Don. 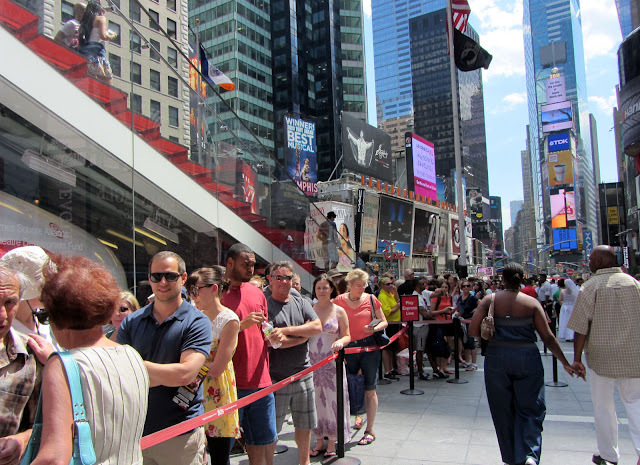 On our way we saw the line for the TKTS booth. It was 2:40, twenty minutes before the discount seller opened, and the line was snaking all the way around the square. 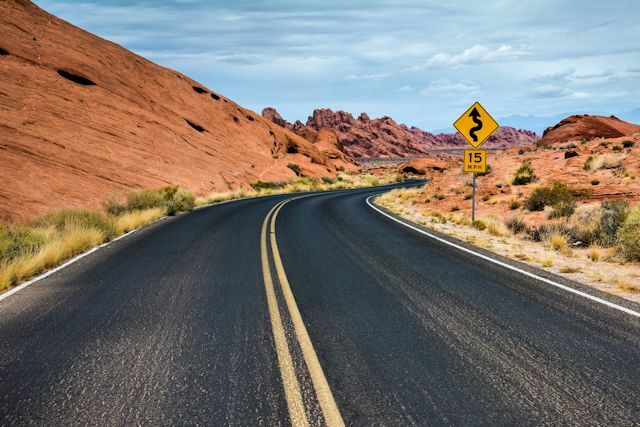 We thanked our lucky stars for the serendipitous experience that allowed us to avoid this waiting nightmare earlier in the week and promised to keep our secret solution silent. Our week was finally drawing to a close and it was time to head back to Newark airport for the flight back home. There was no doubt we had enjoyed a fantastic adventure with our Yaya sisters. Our only regret was that it had to end. But we'll be back for more... someday... somewhere.